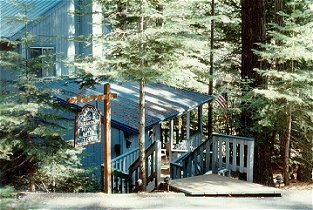 Open year round and only two miles from Yosemite's south entrance, Karen's is nestled in the towering pines and whispering cedars. This Inn was built with special attention to the needs of guests visiting Yosemite and environs. Each room, delicately decorated, has a full ensuite bath, individual temperature control and woodland view. A small sitting room with gas fireplace and library as well as the main living room, with wood burning stove, for visiting, watching TV or videos. Afternoon refreshments are served compatible with the season - lemonade, cheese and fruit in summer - cocoa, tea or hot cider with cookies in winter. The formal dining room is the setting for the beautiful country breakfast, served by candlelight with a variety of tempting choices each morning. Karen helps guests to sort out all the options Yosemite offers in each glorious season.